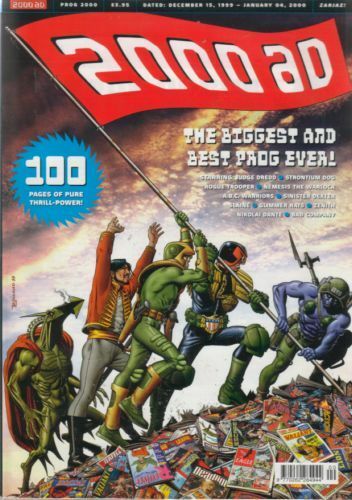 First 'Annual Prog' celebrating the best 2000AD talent from the last 22 years. Chronologically, the issue follows prog 1173. The stories continue in the first issue of 2000 (prog 1174). Original Strontium Dog creators (John Wagner and Carlos Ezquerra) reunite for a tale from Johnny Alpha's past, Dave Gibbons returns for a final 'chronological' Rogue Trooper story and Pat Mills writes the very last Nemesis the Warlock adventure (with art from original co-creator Kevin O'Neill).